Say what you want about British food, one thing that I think they absolutely nailed which has never really caught on in the US is a hearty breakfast of beans on toast. It’s a simple meal and so filling and delicious without being too heavy. 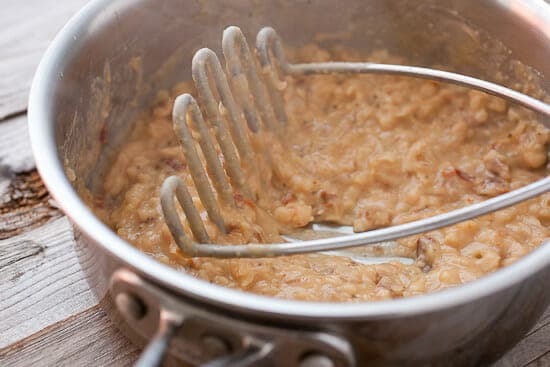 If I were going for a Tex-Mex thing, I might use pinto beans and serve this on tortillas, but for a very different flavor profile I used white beans and mashed them with big flavors: Sun-dried tomatoes and shallots. It takes maybe 15 minutes to make and you really only have to chop a few things. I think the finished toasts look actually fancy for what is historically peasant food! 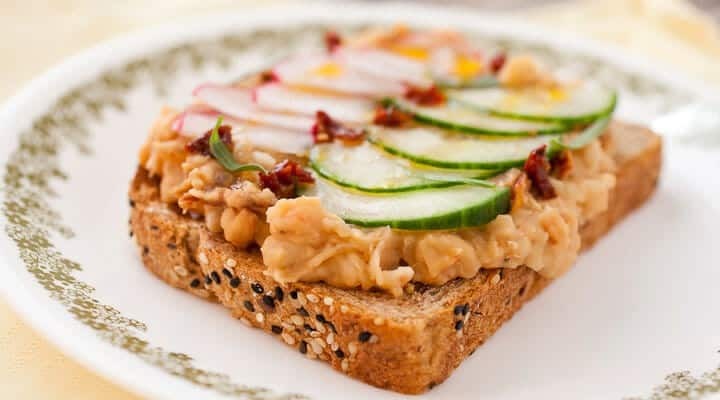 The combo of creamy beans with crunchy toast and veggies is just perfect. Do not give up on beans on toast. It’s something that anybody looking for delicious, quick breakfasts should be making. White bean toasts with creamy cannellini beans, sun-dried tomatoes, and crunchy vegetables on thick toast with a crispy olive oil fried egg! 1) In a small to medium pot, add butter over medium heat. Once melted, add sliced shallot and cook for a minute. 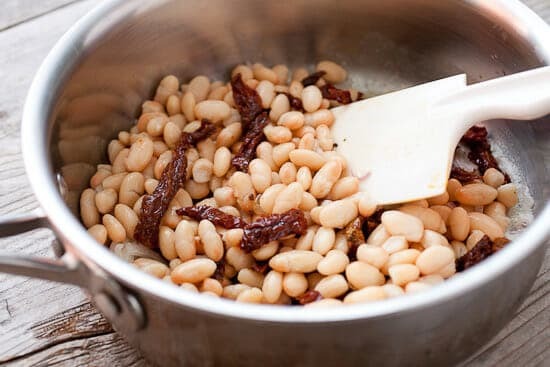 Stir in drained and rinsed beans, sun-dried tomatoes, and 1/4 cup water. Simmer for a few minutes and then mash lightly with a potato masher or fork. Some lumps are okay. 2) Toast bread and slice veggies thin. 3) For egg, add about 1/4 cup of olive oil in a large skillet. The olive oil should coat the entire pan. Heat over medium heat. Once hot, crack in eggs. Cook for about 2-3 minutes until eggs start to get crispy around edges and whites are mostly cooked. Then use a spoon to spoon the hot oil over each egg, cooking the top of the egg. 4) For serving, add a big smear of bean paste to each piece of toast. Top with sliced veggies and a drizzle of oil from sun-dried tomatoes. Add a few fresh tarragon leaves and a crispy fried egg on the side. Season with coarse sea salt and serve while warm. 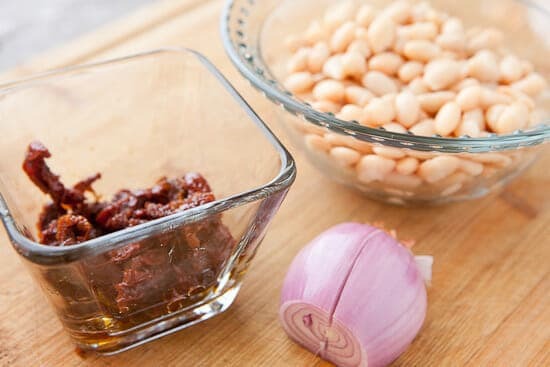 The bean mash is sort of the star of the show here, but it’s really only a few ingredients and is super simple to whip up. Add a little butter or olive oil to a medium pot over medium heat. Then add in the shallot and cook it for a minute or two just to get it softened. Then add in the white beans (drained and rinsed) and the sun-dried tomatoes. I like the sun-dried tomatoes in oil. I think they have a bit more flavor and you can use the oil in the jar to drizzle over the toasts before serving. Season the beans with a little salt and pepper and mash them up. This mixture shouldn’t be completely smooth. Some chunks are nice. I just used a potato masher but you could use a large fork. To round out the breakfast plate, I served my toasts with crispy fried eggs. Instead of soft, pillowy eggs, this method actually gets the edges and bottom of the egg a bit crispy which is a nice texture change. Add a good amount of olive oil to a skillet over medium-high heat. Let it heat for a minute or so and then crack in your egg. As it fries, the egg will get crispy around the edges. 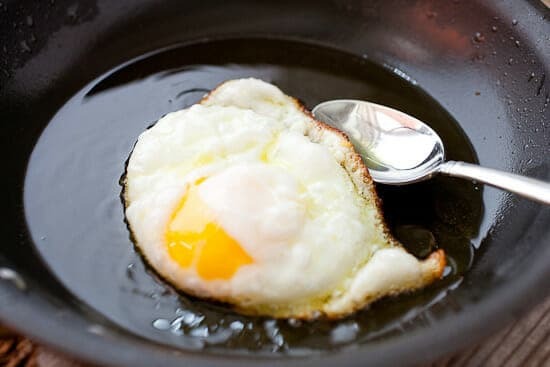 Instead of flipping the egg, use a spoon to ladle some of the hot oil over the top of the egg to finish cooking it. By keeping the egg on the same side for the entire fry, it gets nice and crispy on the bottom but not overcooked on top. 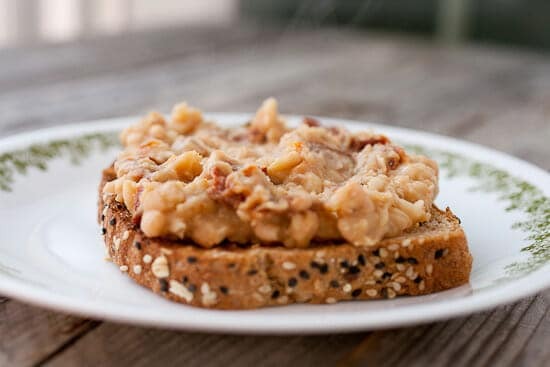 Use a nice sturdy piece of bread for your toast and add a nice thick layer of bean mash to the toast. One toast is basically a meal so it should feel substantial. To top off each toast, add some sliced radish, cucumber, fresh tarragon (optional), and a drizzle of oil. You can plop the egg right on top or serve it on the side or not serve it at all! You might not think you want beans for breakfast, but trust me. It’s a great way to start the day and gives you lots of energy to hold you over until lunch. Please tell me I’m not the only one who likes beans on toast! Leave a comment! This sounds delicious. Love the white beans and love new ideas for serving them. My boyfriend, who’s English, introduced me to beans on toast – although he can eat it for breakfast, lunch or dinner . 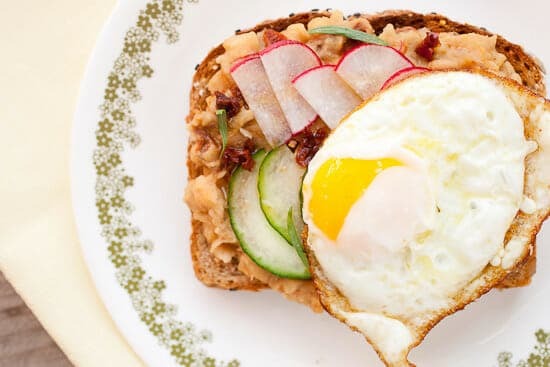 He’s stuck on traditional Heinz Beans for his toast (I have to admit I’ve grown to love those beans, too, especially with an egg on top), but I like the idea of branching out — your take on the British classic looks delicious. Well, I’m a big fan of the traditional version also, but this is a nice twist. If you get him to try it out, let me know what he thinks! I’ve never had beans on toast. I have a batch of navy beans I made with ham hocks that would rock on toast. Plus, this is the perfect brunch set up. Cheers Nick! Perfect breakfast, or lunch, or tea… especially as you included the ‘gourmet’ garnish of a fried egg. I love Heinz for convenience and comfort but white beans mixed with crumbled crunchy bacon and barbecue sauce or yellow mustard is fab too – cover the toast with shredded cheddar cheese first – British children call them ‘cowboy beans’. Actually sounds good. Not something I would have come up with on my own, but then again that’s one of the reasons I follow you. Thank you. What a fantastic breakfast or easy lunch idea. 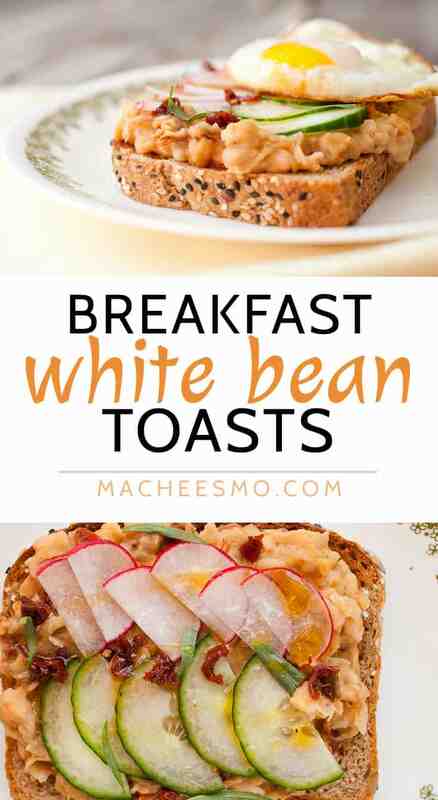 In fact, these delicious looking toasts would make a terrific light dinner after work too! Thanks Felicity! Definitely one of my fave fast breakfasts. Not sure why it has never really caught on here in the states! Oops… I forgot. Try adding spinach, or even some diced ham. Sturdy buttered toast is also a must!! !